Kakou, a synthetic human alongside Kokuyou and Sekiei, appears before Boruto and Ōnoki with orders from Kū to capture Ōnoki. 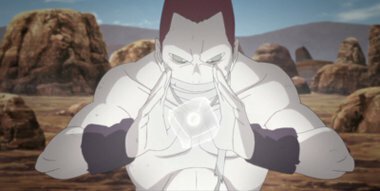 Boruto and Kakou engage in battle, though Boruto finds himself struggling, as Kakou was designed for the sole purpose of fighting and was capable of Dust Release ninjutsu. At the same time, Shikadai manages to slip past the Akuta that guard Iwagakure in order to deliver news of Iwagakure’s situation to Konohagakure.